Collect data fast with intuitive poll surveys. 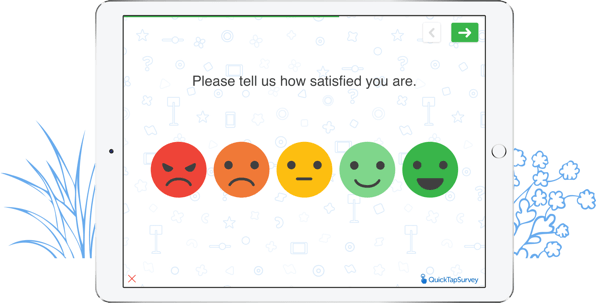 Use QuickTapSurvey's offline poll app to get instant feedback with mobile surveys. No internet connection needed! Engage your audience with powerful tools. Don't let being away from your computer keep you from collecting data. Use our poll app for Android, iPad, or iPhone to easily gather the info you need anywhere. Need to collect some quick info while out and about, but don't have an internet connection? No problem. Capture data offline without worrying about losing data. Customize the way you capture data with multiple field types. Ask poll questions via multiple choice, rating scale, list, or satisfaction and star rating questions. Design and launch professionally branded poll surveys in minutes without needing to know any code. Add new background images, insert your logo, and more. Boost your response rates with a smooth, error-free polling experience. Custom keyboards and shortcuts make data entry easier, faster, and more accurate. View your poll results immediately after they are submitted. There are multiple reporting options at your fingertips, including PDFs, NPS reports, and more. A thank-you goes a long way. Send automated confirmations to participants thanking them for completing your survey and instantly alert your team to new submissions. At a conference or out in the field? Turn your tablet into an interactive data kiosk to set your poll surveys to auto-pilot and easily track uptime and performance. Turn your poll into a contest or giveaway with a variety of sweepstake tools to choose from, including scratch card, instant draw, random winner, and more. Join hundreds of smart businesses. Over 150,000 users use QuickTapSurvey's offline poll app to enhance their data collection and gauge customer satisfaction, conduct research, capture leads, and more. Connect your poll surveys to hundreds of apps, including Zapier, Salesforce, and MailChimp. Organize results in spreadsheets, add new contacts to your email marketing lists, update your CRM with fresh leads, and much more. Collect the info you need to succeed. Engage attendees and visitors at events by letting them participate in a poll at your booth. Out in the field? Conduct research anywhere by pulling up a poll survey on your mobile device. Create a quick poll at your checkout counter or front desk to keep tabs on customer happiness. Conduct polls no matter where you are. See QuickTapSurvey's offline poll app in action by starting a free trial. No credit card required.